Originally engineered for aerospace and aviation applications, 303® Automotive Protectant provides superior UV protection for any rubber, vinyl, and plastic surfaces of your vehicle, such as your dashboard, windshield wiper blades, and even your tires. 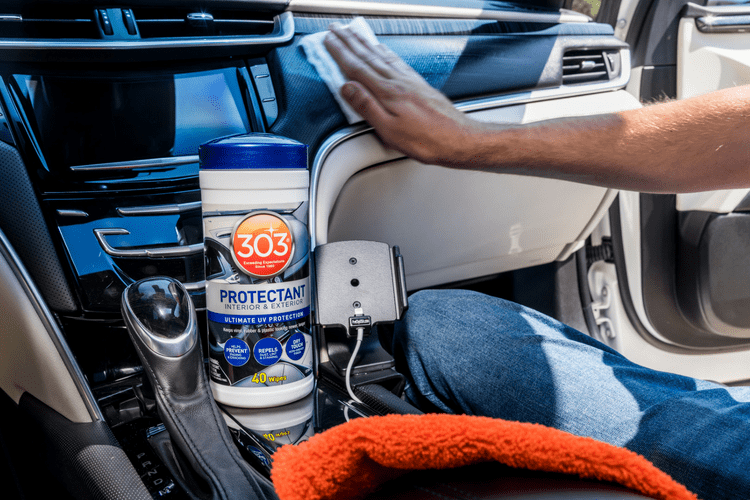 Unlike many protectants that leave greasy residues, 303® Automotive Protectant dries to a clear matte finish without that sticky, shiny slick feeling. 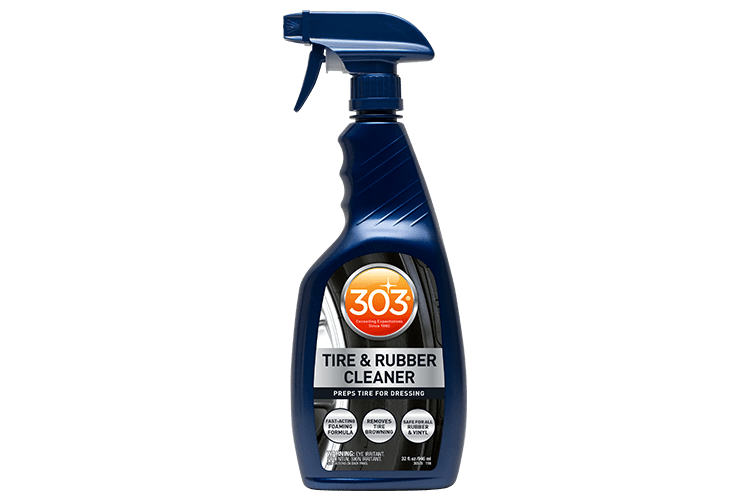 Does 303® Automotive Protectant contain silicone? 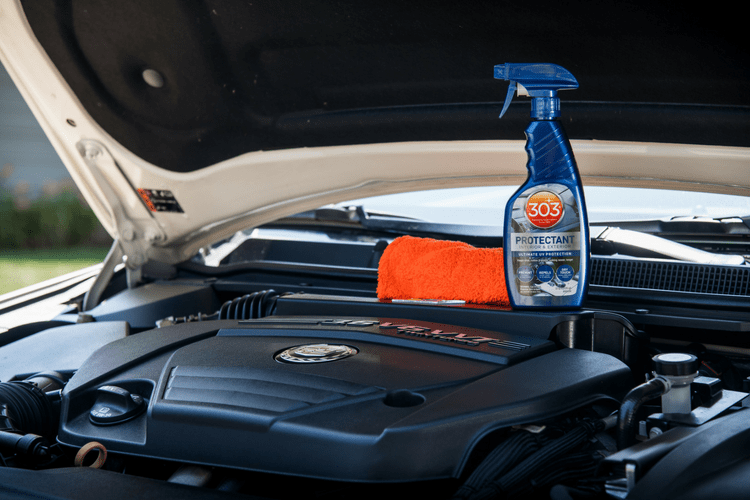 What surfaces can 303® Automotive Protectant be used on? 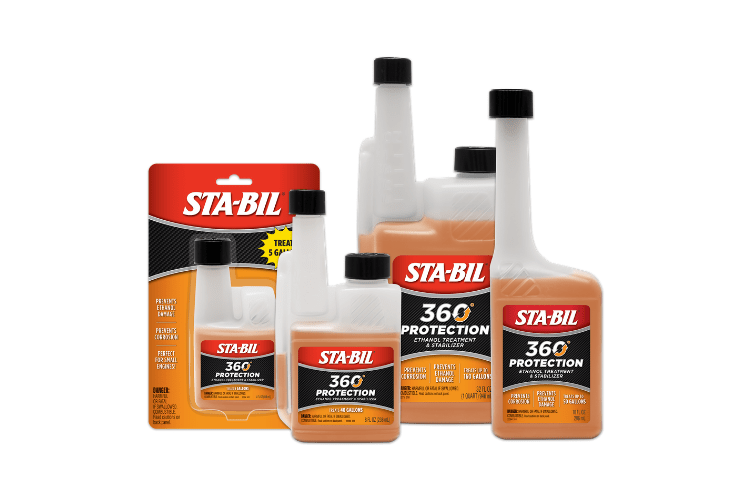 303® Automotive Protectant is rated 4.6 out of 5 by 95. Rated 5 out of 5 by Xlliblx from Goodbye 60% hello 100% The 303 protectant is hands down the best option for your car or truck! I have tried others but they fail to maintain the shine and like new appearance unless you apply it every other day. I used this on my 07 GMC Acadia that 3 kids and a family dog loved to get dirty and When I recently traded it in the dealer asked how do you get your car looking so new still inside! I replied 303 gold eagle. Nothing better and I gave him the remaining bottle in my SUV. Rated 5 out of 5 by AlfasandAudis from My New Protectant I have been using the same protectant for almost 30 years. Although more shinny than I preferred it lasted longer than most and when mixed with water looks ok. It did have an issue fogging up the windows when it broke down. I tried 303 Protectant last month. Easy to apply, looks great and I haven't had fogging issues. Also works well on exterior rubber and plastic. So far is holding up well. I will be using this on both my new and classic vehicles. Rated 5 out of 5 by Htweelr from Best product out there I was introduced to 303 protectant about 15 years ago when I was working for a major airline. They had us use it on almost all surfaces after a major maintenance cycle. I've been using it on my vehicles ever since. It does everything the company says it does. I've used all the premium products out there and no one else even comes close to 303 performance. I now use it on my new Jeep Rubicon to keep it looking new. Rated 5 out of 5 by madman24 from Greta Product! Used this product on the dashboard of my SUV. This cleaned and protected the surface as expected. The kicker with this product is that it did not leave a shiny, greasy surface afterward. Clean and dry to the touch after a few minutes! The fact that these are wipes as opposed to a spray let me confidently clean the dash without the worry of over-spray on glass or dash electronics. Greta product! Rated 5 out of 5 by Copo2547 from 303 protetant Grear product not only does it work well it smells great. Rated 5 out of 5 by The 79Grenade from Excellent Product for Show Quality Detailing I used the product on my 2007 Mustang prior to the Mustang show at Carlisle, and was extremely impressed with the results. I used it as a cleaner/protectant at the same time, under the hood, on the interior, and the exterior plastic and rubber surfaces. It provided a clean satin finish that lasted a good 4 months on a daily driven vehicle. It is now my go-to detailer for all my vehicles. Rated 5 out of 5 by A in AR from Superior protectant! I'm super happy with the 303 Automotive Protectant! It cleans and protects well, without leaving the greasy film behind that so many other protectants do - which is huge! I would highly recommend this line of products to anyone who wants to keep their vehicle looking nice and/or give a little love and rejuvenation to something with a little more wear on it. This stuff is awesome!! Rated 5 out of 5 by ChillyWilly from 303 Spray Automotive Protectant I bought this product with hopeful expectations that it would help to restore and brighten the finish on our two kayaks. It worked great!. We use it first thing in the Spring, and reapply every 6-7 weeks, keeping our kayaks looking new all Summer long. Our neighbor ask what we were using, and he has now converted to 303 products as well. Excellent product. Rated 5 out of 5 by Sarah P from Absolutely love this product!! 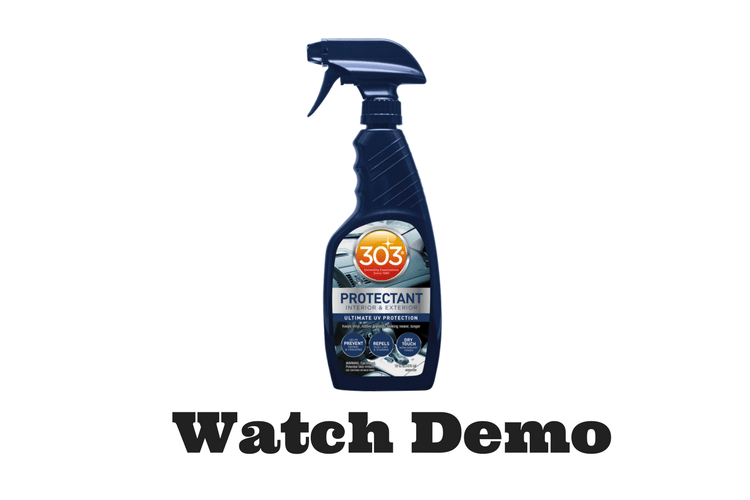 I had previously tried 303 Aerospace Protectant wipes, and really was impressed with them. My only complaint would've been that they leave a bit of greasy feel behind. Not a huge issue, but had I been given the choice, I would have wanted to change that. These are perfect! Cleans,protects, and do not leave behind an greasy film!! Love them! Rated 5 out of 5 by Anonymous from Better than competitor brands! I have use this protectant in two different cars and the results could not have been better. All the vinyl, plastic and rubber in the interior and on the exterior plastic parts and tires. Everything looks better than new now. The directions say to buff with a dry cloth for best results. Don't skip that step or you will get streaks. Rated 5 out of 5 by nehiba from Great protection I got these wipes a month ago they are a convenient mess free way to protect your cars interior. 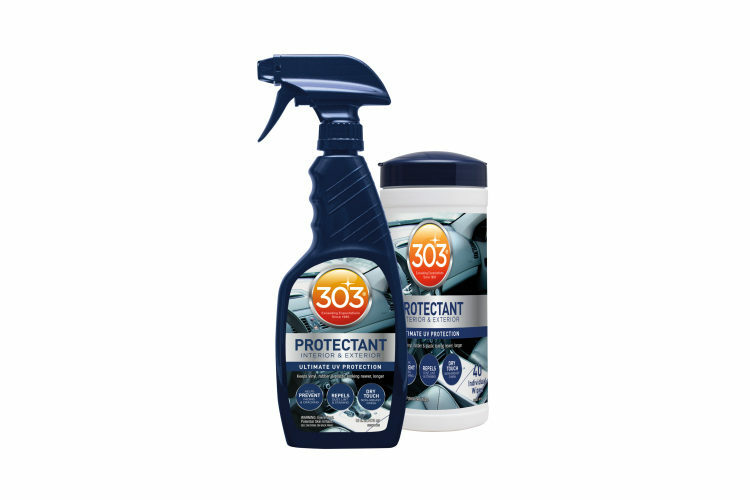 303 protectant provides protection in the harshest conditions I have used it for years on my cars and boat. My boat sits in the sun for weeks at a time but with regular treatment of 303 the vinyl interior still looks new. Rated 4 out of 5 by tbirk from Fast and easy I used the product for the interior in my hatchback. It has a deep dashboard on a car that is not garaged so its large footprint takes in lots of sun. It is quick and very easy to use. The extra step of wiping it all down delivers nice results and doesn't leave any residue. Rated 3 out of 5 by Perks from 303 protectant Great product. The convenience of the wipes helps when working in areas where overspray is an issue. Rated 5 out of 5 by Craig from Easy to use great results I had also used the "303" protectant in the spray bottle format and was pleased with the results. Sometimes it's hard to find a handy rag to apply this and I thought I would try the "303" in the handi wipes version. I was just as pleased with the end result that I had with the spray bottle, no oily residue easy to apply, no odor and definite results. As a bonus no rag wasted and easy to dispose of. Nice product. Rated 2 out of 5 by Autobroker from 303 Protectant INT & EXT I used these wipes on my Cars. It seems that the shine that it produces is a little more than I would find acceptable for my taste. Especially on the Dash way to shiny when the sun hits it Causing a glare Hazard. I found it works ok on the black weather stripping. It appears to lose it's luster if it comes in contact with your skin & clothes like along the top of the door Panels when you rub up against them.. Rated 3 out of 5 by NOCASH from Handy Easy to use wipes and dispenser pack. Not enough saturation on the wipe. Took several wipes to do one small area so it would have a consistent look. Not greasy .......... I like that! Rated 1 out of 5 by Chief from Good Interior Protectant ONLY! I have been using 303 on my auto interiors for years and it works great. I noticed this automotive specific bottle recently and decided to give it a try on my truck. The label says that it works on exterior plastic and rubber and my truck has a lot of it. My truck looked great for a day. The next day it rained and it all washed off. I live in Florida where we get almost daily afternoon showers in the summer. Who in their right mind wants to reprotect their exterior vinyl every few days. If a product is labeled for exterior it needs withstand the elements. People are willing to pay a premium price like 303 charges when it works. I returned my bottle to the auto parts store for a refund. This product is a 3-star interior product. Open your door in the rain and you get streaks running down your vinyl. If it would repel water it would be 5-star product all around. Instead it is water soluble. Rated 3 out of 5 by Outlaw525 from Worked good Cleaned well, lifted dirt from the vinyl upholstery and plastic trim but left a sticky residue behind. Rated 5 out of 5 by Art63 from great all around product Bought about 2 months ago. Very versatile, great on rubber/vinyl, plastic and some leathers. Wipe on, let sit for a few minutes, wipe off: nice dark, matte finish, no residue. I really like the way it looks on tires, durability may not be the longest, but for the looks and ease of use not an issue. Rated 5 out of 5 by SKMartin6 from Great product goes on easy Just got to use this product over the weekend. Very easy to apply, one sheet has a lot of coverage. I have black interior in my truck and it looks great. Not sure how long in last but instructions recommends reapply after about 3 weeks but as easy as it is to use shouldn't be a problem. Rated 5 out of 5 by madman24 from Works as Advertosed Used this product on a leather couch and the seats in my SUV. This cleaned and protected the surface as expected. The kicker with this product is that it did not leave a shiny, greasy surface afterward. Clean and dry to the touch after a few minutes! Greta product! 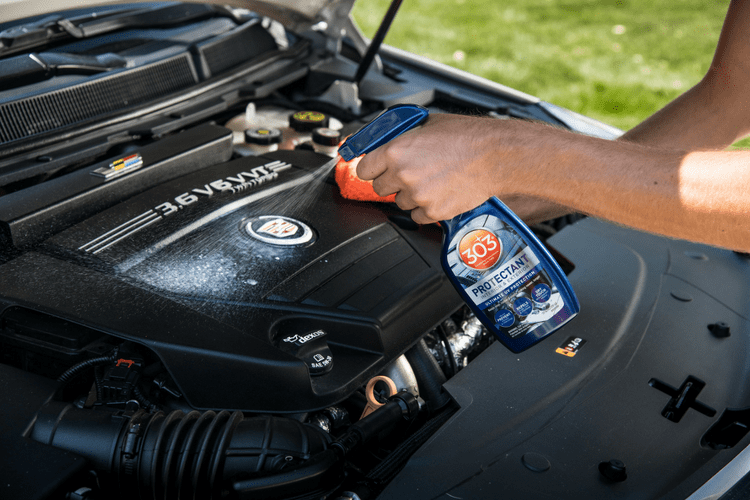 Rated 5 out of 5 by ChillyWilly from 303 Protectant wipes We have used 303 spray to preserve the finish on our kayaks, and bought these wipes for quick touch-up applications to use between our regular maintenance with the spray. I am looking forward to trying on the dashboards of our vehicles, as well as our boat. Rated 4 out of 5 by hotrod from 303 Protectant I used the 303 Protectant on the interior of my picks dash/side panels. It was very easy to apply with the wipes and easy to wipe down with a micro towel. It spread well and provided a nice shine. It does seem to collect dust as other product do. Rated 4 out of 5 by Fstball26 from Great product I've used this a couple times since getting it, used on different cars and surfaces and it works really well. The only reason I gave it 4 stars is that it has a tendency to leave a tiny bit of film behind. Still better than other ones I've used. Rated 5 out of 5 by flashfearless from Protects your interior finish without buildup The great thing about this product is that it restores the finish to a very clean slightly damp look without the buildup which can be caused by other products. 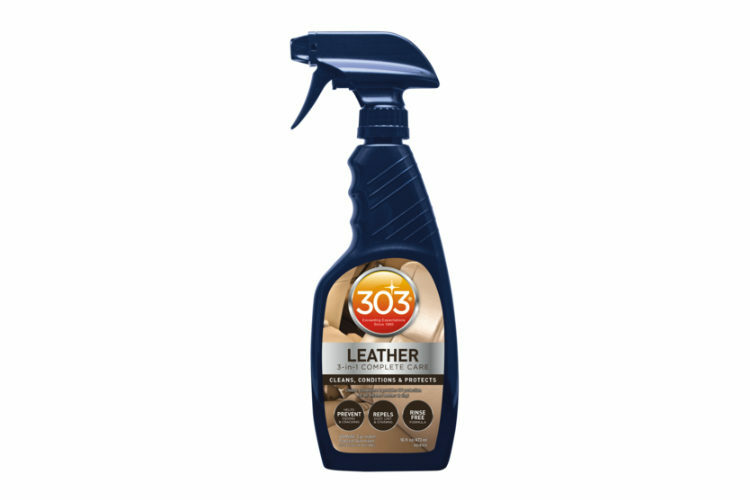 I used it on plastic surfaces and pleather surfaces. Don't use on leather surfaces. Rated 5 out of 5 by A in AR from Easy to use 303 Automotive Protectant wipes are wonderful! I'm so glad I was able to give them a try. They clean well, and protect well, all in one step. It made everything look great and rejuvenated! And they're so easy to use, I highly recommend them!! Rated 4 out of 5 by Dennis from Great product! This product works well on all interior surfaces. I have used it on the dashes and door panels of both of my vehicles and found that whether the surface is 5 years old or 35 years old, it cleans and restores the surface very well. Rated 5 out of 5 by fishy from Works Great! I tried 303 Protectant today and it covers well and adds the new look back to my car"s dash. It works well and covers sufficiently. I would use this product again. The Gold Eagle products that I've used are quality products.